Wednesday evenings are Mosaic Workshops, 6-9 pm. This is an opportunity for the community to visit the studio and help with a large mosaic project on my building. This is a three contact hour workshop. There will be instruction on the history of Egyptian Paste Faience beads, demonstration of marbling, rolling, cutting and forming beads to be once fired and one-on-one help for students to create their own beads and ornaments. Instruction sheets of this 3000 year process are included and distributed to participants. Egyptian paste is made up each time fresh for use. Eight colors will be provided for total of 15 students to work with individual colors or combine and pattern their bead creation. Some molds will be provided to make small animals or medallions. Beads when completed have a bright shiny glaze suitable for stringing, making earrings or just decorative objects. Total fee with instruction, materials and firing, $350. This is a three contact hour workshop. Instruction includes the basic techniques of hand building: Slab, modeling, pinch and coil. Materials (clay) should accommodate up to 15 students to make at least 3 objects to be fired. Pieces will be fired and returned in one week. Students can use acrylic paint to complete the sculptures or pots on their own. Paint or a second glaze firing is not included in this workshop. All clay and hand building tools will be supplied. Example: an assortment of textured rollers, cutting tools, cookie cutters, and rolling pins. Work can be done on tables covered in plastic. Some water used in creating the objects. Age 6 or older. . This is a two session workshop. First day, 4 hours with a break to tile the object. Second session should be scheduled at least 48 hours after tile is glued before setting the grout. Two hour session for grouting. Instruction includes how to cut or break tile, glue and grout a 4 inch flower pot or other small object. Instruction on designing the mosaic pattern or design on the object is included. Simpler designs take less time to complete. Students are encouraged to bring a flower pot, old lamp, bowling ball or other object to tile. Mastic (or glue), grout and assortment of colored tile, goggles for children or adults breaking or cutting tile is provided. Work can be done on tables covered in plastic. Plastic to cover any rugs on the floors advised. Water needed for mixing grout and clean up. Age 6 or older. Total fee with instruction and materials. $ 500. Instruction is given on how to prepare the fiber, and use a drop spindle. Demonstrations will be given on using hand cards, carding machine, drop spindle and spinning wheel. One-on-one instruction is given on how to use a drop spindle and spinning wheel. A variety of fibers such as sheep, alpaca, angora, silk, flax and cotton will be on hand for show and tell. Some of those fibers will be turned into yarns to take home. Age 6 or older. Total fee with instruction and materials $200. Paper making out of recycled materials. There will be information the history of paper making and hands on assistance with students making their own sheets of paper. Handouts are included and distributed to participants. Supplies brought to the site include, three colors of paper pulp, sizing, 3 vats, deckles and frames, felts, blenders, and hand screw paper press . Materials should accommodate up to 15 students to make at least 2 sheets of Handmade Paper. Students are encouraged to bring materials to add to the paper pulp. Example: Yarn, string, confetti, dried flowers, glitter, dryer lint and etc. This makes the paper more unique and personal. Paper can be dried or ironed to flatten and use immediately for drawing, cards or book making. A space with water and electricity needed. Kitchen or cafeteria recommended or the class can be conducted outside as there is access to hose or water. A minimum of 5, 6 foot tables needed. . Age 6 or older. Do you need your pots fired? Fire them at Back Door Pottery! These fees stand with the client loading and unloading their own work. Technical assistance in loading is available. 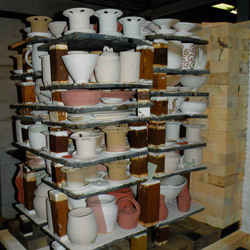 For some of you, renting a kiln may be a better value than firing by the piece. 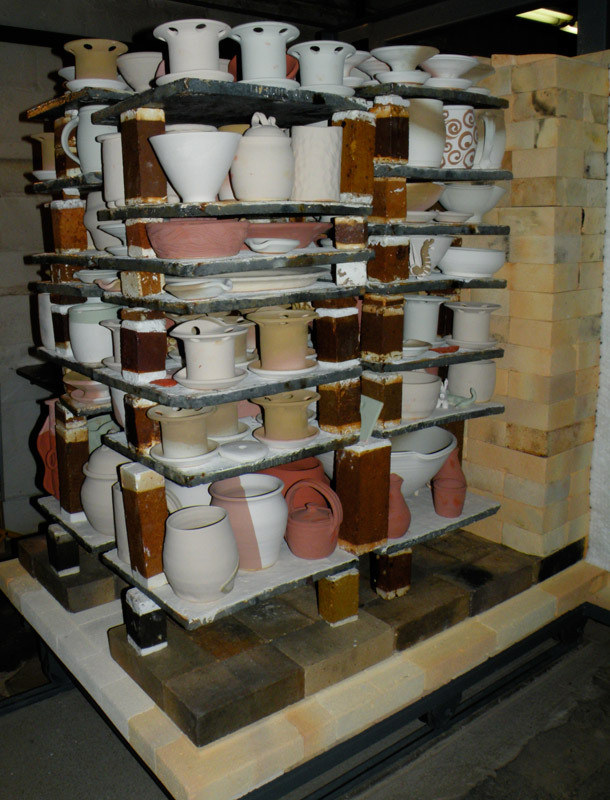 Back Door Potter has recently upgraded it's heart of the studio the "Cone 10 Kiln". 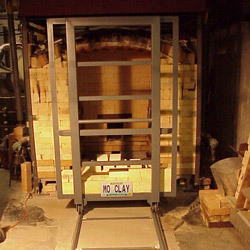 When originally designed and built in 1993 the 40 Cu Ft kiln was to be a car kiln. Everything was constructed to hold the car or sometimes called a cart complete with the concrete driveway. After getting the kiln built money was short for actually building the steel car and tracks, so a temporary floor was put in UNTIL NOW. No more bricking up the door when everything is stacked. Not only is it easier to load for small functional ware, it is now convenient to fire larger sculptural ware. The next upgrade is rebuilding the arch to add 4 more inches to the height. New arch will be later in the year. 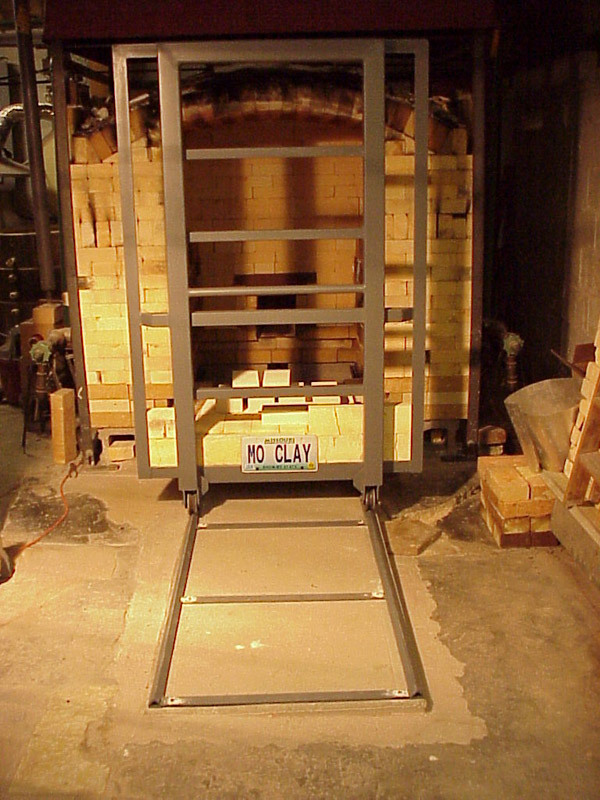 Many thanks go to Dan Siglar for tweaking the design and building the kiln cart and tracks. He also came up with a kiln puller or hitching post to pull the kiln car out of the kiln. I can now pull the cart out of the kiln with the use of the wench hitched to the cart & post. (kind of heavy when loaded) Check out www.ironmandan.com for help in your custom iron work. Thanks also go to super student Lisa Anetsberger for her help in stacking up the bricks and pots on the new cart. She also is responsible for the Wood Fired Raku video on my site. Thank you all. Here’s an opportunity to be creative and develop some new skills. I offer adult classes (16 and up) in wheel-thrown pottery and hand building, RAKU, gas and electric kiln firings are available to students. Interested persons may start at any time with no previous pottery experience necessary. Classes are limited to seven students in order to provide individualized attention to each participant. Tuesdays, 7:00 to 9:00 p.m.
Fees are paid monthly ($20 per class), and include use of the potter’s wheels, slab roller, extruder, pottery tools, library of books and magazines, and personalized instruction for each student. Prepayment is made on the 1st week of the month. If you are unable to attend a pottery session, you may makeup class on the next possible class session. Classes not made up within one month’s time will result in a loss of you prepayment for that class missed. 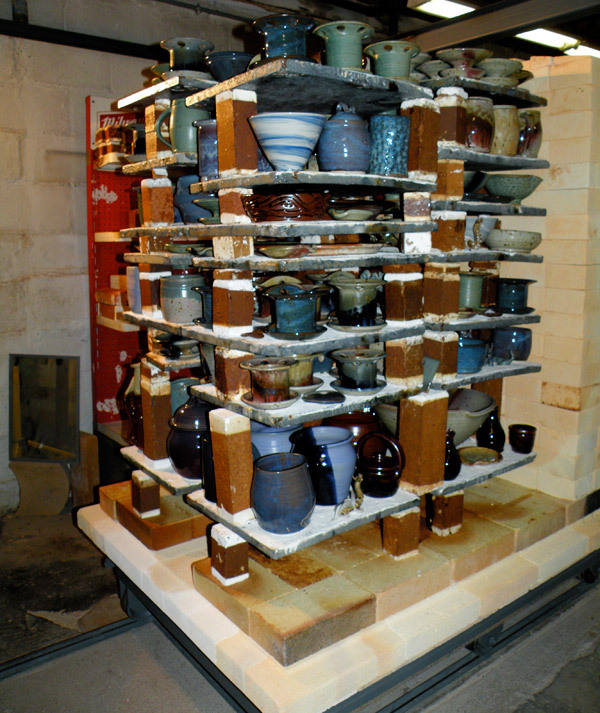 Firing costs include both bisque and glaze firings, either in an electric, gas or RAKU kiln. (Pottery glazes are included.) Cost per piece ranges from $4 to $16. Size or the space the piece takes up in the kiln determines its fee. Payment is made when all firings are complete. Pottery tools will be available for class use, but it is best to have you own. Many tools can be made, or you may purchase one of many kits available from BACK DOOR POTTERY or clay suppliers, The cost of a pottery tool kit is about $13. Clay is available for purchase at BACK DOOR POTTERY, or clay suppliers, The clay is packaged in either 25-pound bags or 50-pound boxes. It is moist and ready to use. Prices run $21 per 50-pound box. Cone 10 stoneware is preferred for beginners and cone 10 porcelain for more advanced students. Clay is dirt cheap and recyclable. 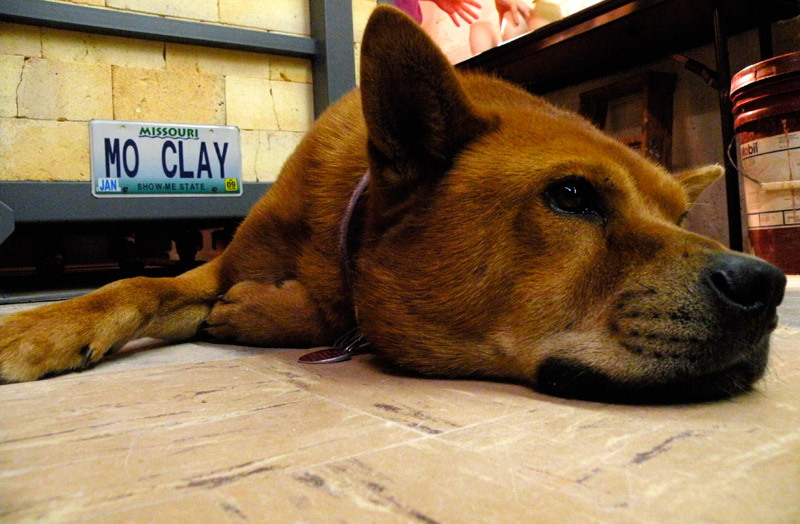 Back Door Pottery is offering clay workshops for organized children's groups, home schools, girl and boy scout troops. The workshops can be customized for badge requirements or school educational enrichment. 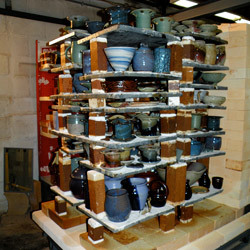 The studio at Back Door Pottery can comfortably hold ten students for a session of 1 1/2 hours. Fees are $10 per child with a minimum of $80 charged per group, workshop session. Ages range from 6 to 16. Workshop participants receive a studio tour, step by step explanation of the clay to product process, demonstrations on the potters wheel and hands on opportunity to make a project in clay. The project is Bisque fired and returned to the group coordinator approximately two weeks later. This is all included in the workshop fee.